Home News BUSINESS AND JOBS 30% tint, no curtains in UAE school buses; cameras next? UAE school bus windows must be tinted to 30 per cent, and not use any curtains or blinds, a senior official with Emirates Transport has said. 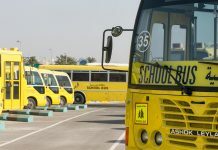 Tariq Al Obaidly, Tariq Al Obaidli, Manager of Emirates Transport’s School Transport Operations, pointed out that the decision will apply to all buses provided by the centre to government and private schools nationwide. He said that the decision was in line with legislation of regulatory bodies such as the National Transport Authority, Emirates Authority for Standardisation and Metrology, Abu Dhabi Department of Transport and Dubai’s Roads And Transport Authority in addition to Ajman’s Public Transportation Corporation (PTC). PTC Ajman has already implemented the 30 per cent tinting rule and removed the installation of blinds, he noted. This rule also applies to all buses of government institutions and private schools.